Dwindling In Unbelief: God hath done these things: The Apocrypha to the Rescue! God hath done these things: The Apocrypha to the Rescue! I've struggled a bit lately with the Book of Esther. Which is why the apocrypha comes in so handy. Here are the first words of the additions to the Book of Esther, as taken from the Catholic Douay-Reims version. Then Mardochai said: God hath done these things. The folks at DRBO.org add this helpful note to Esther 10:4. Then Mardochai: Here St. Jerome advertiseth the reader, that what follows is not in the Hebrew, but is found in the septuagint Greek edition, which the seventy-two interpreters translated out of the Hebrew, or added by the inspiration of the Holy Ghost. So we know that Esther 10:4 was added through the inspiration of the Holy Ghost, and that therefore, God was responsible for the killings in the Book of Esther. Thank God for the Apocrypha! For some time now, I have wanted to add the Apocrypha (or what Catholics call the Deutero-canonical books) to the SAB. I've finally started with the book of Esther. As I go along, I'll add the apocryphal killings to the list of killings in the Catholic Bible. That way, I'll have two lists: one for the Protestants and one for the Catholics. 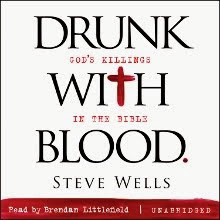 Does this mean you'll have an expanded version of "Drunk with Blood"? Yeah, I think so. There's quite a bit of killing that I haven't yet covered in the Apocrypha/Deuterocanonical books. But I'll get to it eventually! I've always liked the Book of Esther, in spite of the overkill. It has sassy ladies and leads to fantasies of barbarically gorgeous ancient jewelry. I suspect the uppity females bit is the real reason why it was taken out of the bible, ditto Judith. But I'll get to it eventually! I'll look forward to that. Meanwhile, I haven't forgotten my informal proof-reading project... I'm just side-tracked re-reading another of my favorite Holy Books: "The Silmarillion". Happy Christmas/Winter Solstice/Other to you and your family! I am curious as to why you always quote the KJV? It actually makes you seem a little behind the times... scholarly speaking, so I assume there is a reason for it? The KJV is probably the most-quoted version of the bible because, IIRC, it was one of the first versions published in English (I could be wrong about this). It has had a significant impact on English literature... even Richard Dawkins says this. However, according to Bart Ehrman the KJV is based on some poor translations, possibly even fraudulent translations (again, it's been a while since I read Ehrman, but I think I'm remembering correctly). Consequently, the KJV is a virtually endless source of nonsense. IMO, that justifies being a little behind the times. YMMV. Does that mean that unbelief is dwindling, or does it mean dwindling into unbelief?